The film recreates the entirety of the Live Aid set, and the power of the band and Mercury shines brilliantly in that sequence. Rising star Rami Malek is simply a revelation as Freddie, and manages to capture a bit of the larceny and vulnerability of his immigrant’s outsider status and closeted-gay-man-in-the-wrong-era identity. 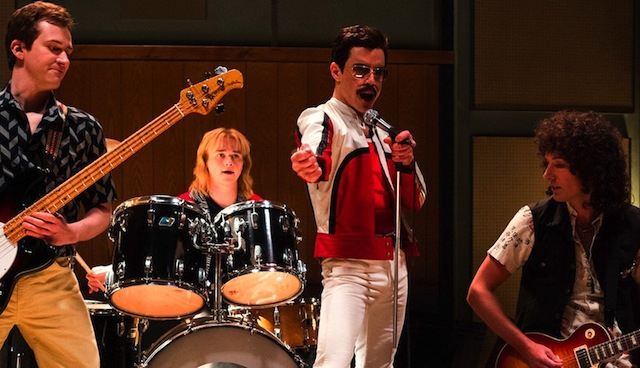 Also remarkable are the actors portraying the rest of the band, it’s as if Queen was portraying themselves in their own story. The story – band rises, then falls, then rises again – has been seen before, and that is the disappointment, although to me it was a minor one. 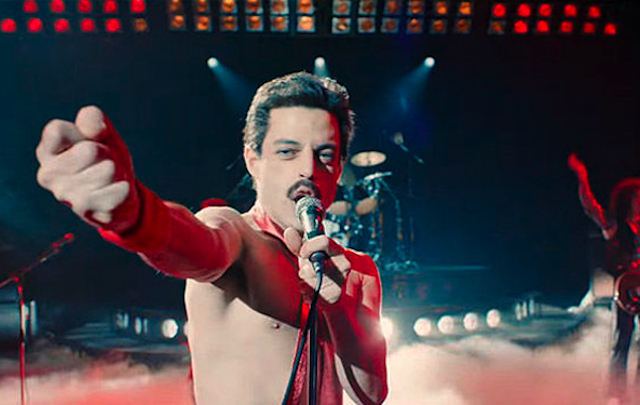 Queen is a band that needs to be celebrated, and the film strives to “keep themselves alive.” The concert moments are the best, and the glimpse into the studio during the formulation of “Bohemian Rhapsody” was also nice, but that also had a behind-the-music that didn’t have the same electricity as the concert moments. There has been some general early criticism regarding the “PG-13” status of the film… it leaves out the darker elements of Freddie’s plunge into disease and how is affected the state of Queen… but that’s really for a another movie, that might yet be made. This was more about the rising fortunes of the AM/FM era of radio risk takers and the rock heroes of a long time passing, which for this old timer was pure bliss until it wasn’t. But all things must pass. “Any way the wind blows doesn’t really matter to me” came out of the tinny speakers of 1975 with a hurricane force, and that is what Freddie Mercury and Queen was, a hurricane of magic. “Bohemian Rhapsody” captures the force if only for a moment, as a reminder of what really mattered. To me, back then, at least.